WELCOME THE MAGIC INTO YOUR HOME WITH THE MAGICAL BOOK LAMP. This soft creative lighting solution is perfect to brighten medium sized rooms, and works great as a bedside lamp. Especially to people who are creative, who love fantastic movies such as Harry Potter or even to people who enjoy interior design. The Magical Book Lamp is a multi-functional lamp that conceals itself in the form of a hard-cover book. It opens to 360 degrees and comes with a micro-USB charger (USB cable included) and magnetic wooden pegs for mounting. Magnet: Industrial-grade Neodymium (N52) magnets are built into the wood covers to maintain portability and flexibility. Dimensions: 6.5” (16.5cm) W x 8.5” (21.5cm) H x 1.25” (3cm) Weight: 1.5 lbs (0.7 kg) approx. MAGICAL BOOK LAMP PROVIDES A PERFECT LAMP AND AN AMAZING GIFT. THIS BABY WILL MAKE YOU FALL IN LOVE STRAIGHT AWAY. OPEN TO BRIGHT UP YOUR DAY AND CLOSE TO TURN OFF THE LIGHT AND BACK TO A BOOK CARRY IT ANYWHERE / USB CHARGE / STANDBY OF 3-4 HOURS. Buying items online can be a daunting task, so we want you to realise that there is absolute ZERO risk in buying something and trying it out. If you don't like it, no hard feelings we'll make it right. "I bought this as a gift for my 10 yr who is an avid reader and needed a night light to help her unwind at night. This wooden book led light has been a perfect addition to her room and desk. 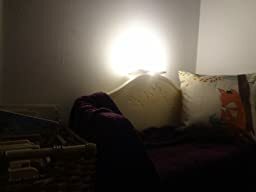 It provides a nice warm light at night that she enjoys viewing before falling asleep. It came with with a usb cable for recharging and easily closes back up as it has built in magnets on each side and they attract to each other." "This is definitely the most unique light I have ever purchased. It is so beautiful, and puts off just the right amount of light to use during the day or night. Being able to hook up its USB cable and recharge it any time you like is so convenient, and the charge lasts for almost 8 hours. I am using it in one of my child care rooms for their relaxing and reading area. Whether we lay it down wide open, or stand it up only partially open, it still brightens up the area perfectly. My favorite feature is that it does not have to be plugged in like most lamps, because that is always a danger for children. This book light is so pretty it could enhance any room. I highly recommend it." 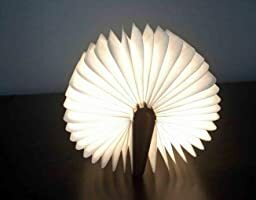 "I love this book lamp. The quality of the lamp is very good. It sets a relaxing mood for me when I work at computer. I put it on my computer desk and I turn it on every night and have not found any problem yet. It feels good when you open the covers and the pages turn to light. I am going to buy the normal size as a gift to my friend." Beautiful light and wooden cover, everything was very well packed. courier handed door to door, which is very convenient. I recommend it. Super Fast delivery. the seller sent the goods the next day after the order. track to track. good packaging. ordered a second one as a gift. really liked the idea of the lamp. and the performance is also at altitude. Great packaging. fully consistent with the description. a great gift. I recommend. Amazing! This light is very interesting and I am so impressed with its design. The quality is very nice. It is a very modern looking light. 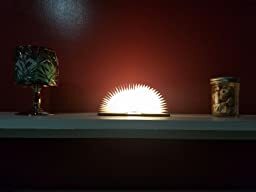 When my friends see this light, they always want to figure out how it works I usually keep this book closed to avoid sitting dust on it but when I have parties or guests, I use it as a decorative light.